Data Cube is the industry’s most powerful SEO research solution to prioritize and formulate successful search and content strategies. Powered by DataMind, Data Cube reveals which web page URLs and content types are winning the top spots on SERP (search engine results pages) for any search keyword. Data Cube shows the complete list of keywords that your entire domain or a specific web page is ranking for. Some phrases and topics may already be included in your SEO target list. Others may surprise you. Evaluate them to create new and better-performing content that engages your customers. Grow market share and revenue by expanding your SEO target keywords. Enter any phrase in Data Cube and, based on natural-language processing, its indexing and retrieval method will return a list of semantically-related topics that are relevant to your SEO target list, disclosing content gaps and opportunities to win rankings. Does your site rank for over 100,000 topics? Turn the task of prioritizing the top ones from daunting to doable using Data Cube’s robust filters. 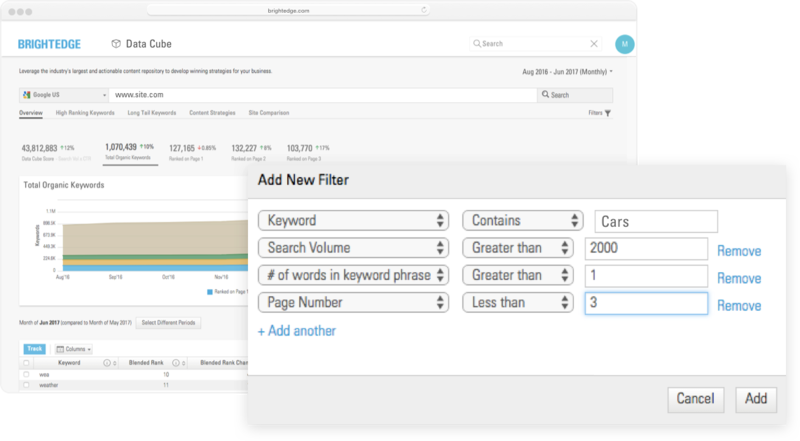 Perform keyword research with utmost precision — keywords containing at least three terms, including “cars,” with monthly search volume of 2,000 or more, ranked on page 2 — to improve your optimization efforts within minutes. 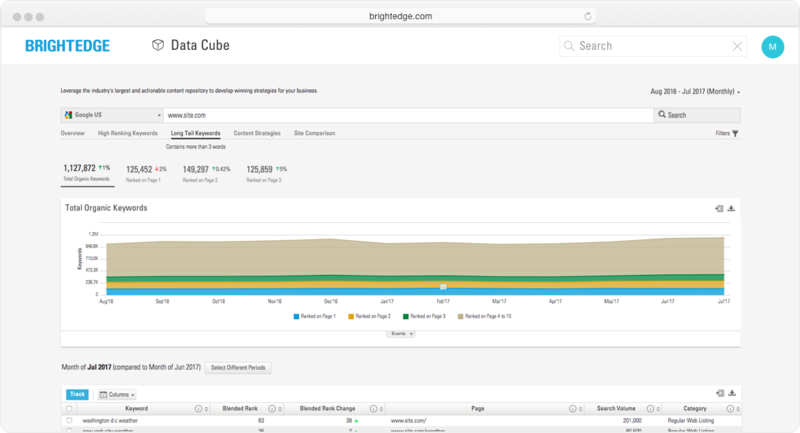 Monitor whether your organic content performs better over time using Data Cube’s trended graphs. Evaluate how well your SEO efforts have improved your search ranking, contextualize fluctuations in your content performance trajectory to spot when and where to dig deeper and see if your competition is trending better or worse. 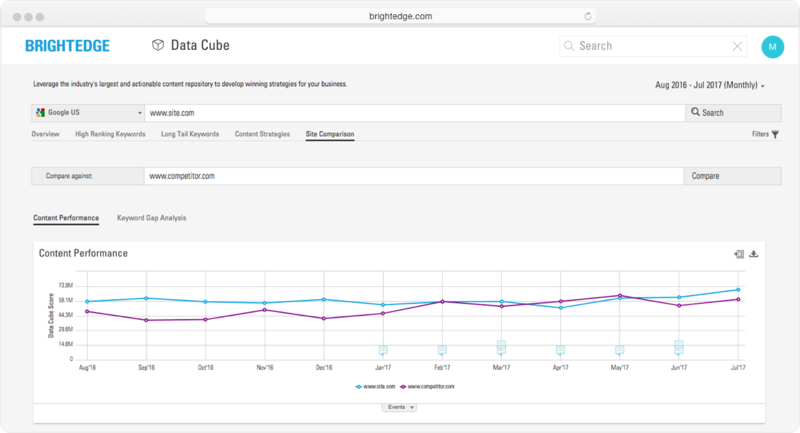 Data Cube combines multiple metrics — including search volume, expected click-through rates, and your organic listing ranking — to provide one score, the Data Cube Score, that demonstrates how well your site is optimized for search. The higher your domain’s score is, the more optimized the domain is for search visibility. Research your competition like never before. With Data Cube, you can analyze your competitors at a domain or specific page level. Detect what keywords your competitor is ranking high for, but your site isn’t, and observe your competitor’s winning pages and content types to boost your own competitive strategies. The SERP has evolved: the top position could be a regular web listing, place, site link, shopping result, image, video, carousel, quick answer box, or Local 3-Pack, depending on multiple factors. 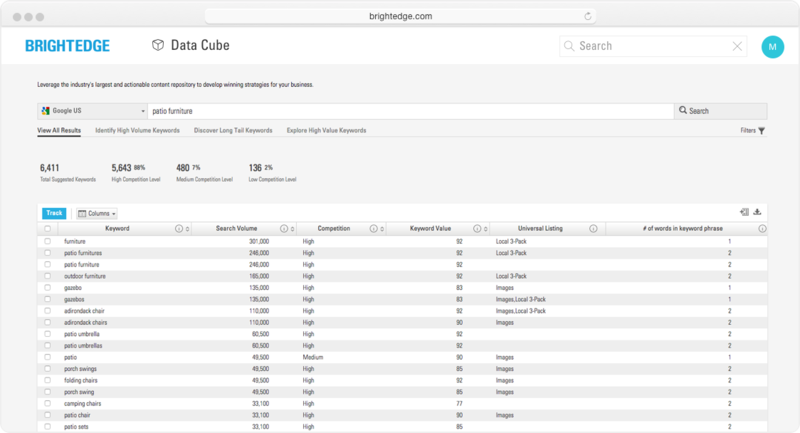 Data Cube allows you to eliminate the guesswork and determine what types of content you should be creating for optimal search engine visibility. 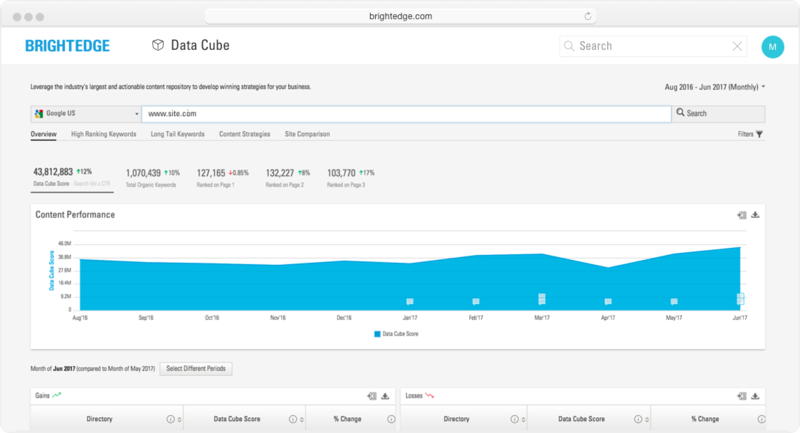 Data Cube’s native integration with the entire BrightEdge platform makes it easy to act on the untapped content opportunities you’ve discovered. Add them with a click of a button to your existing SEO workflow. And you’ll begin evaluating SEO recommendations, content performance, and opportunity forecasts. 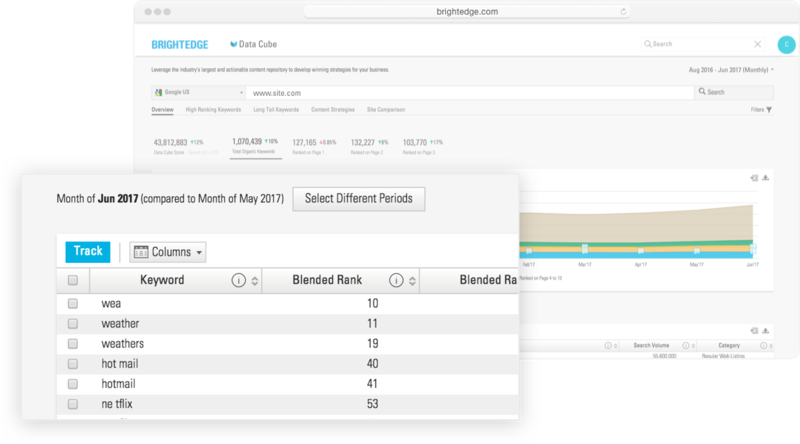 One of my favorite tools within the BrightEdge platform is the Data Cube. 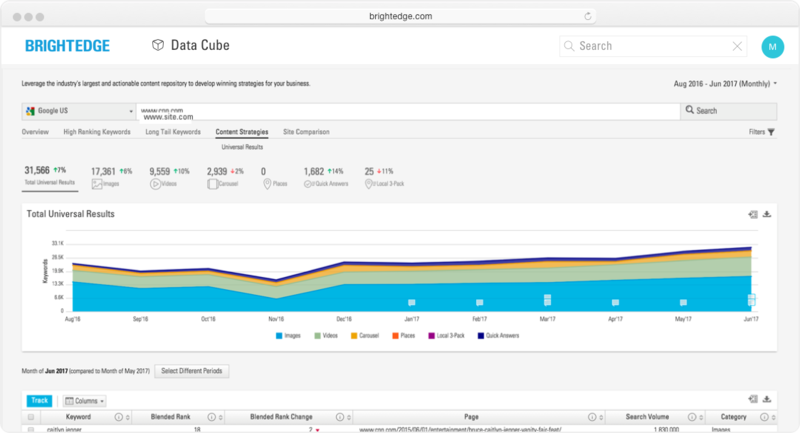 We use Data Cube on a daily basis for doing our competitive research, understanding why we have additional opportunities, really seeing how our content is performing and getting the long view.